DIY LEGO Christmas Projects That Are a Must See! Here are some wonderful DIY LEGO Christmas projects for you or your kids to build. These are sure to get you in the Christmas Spirit! 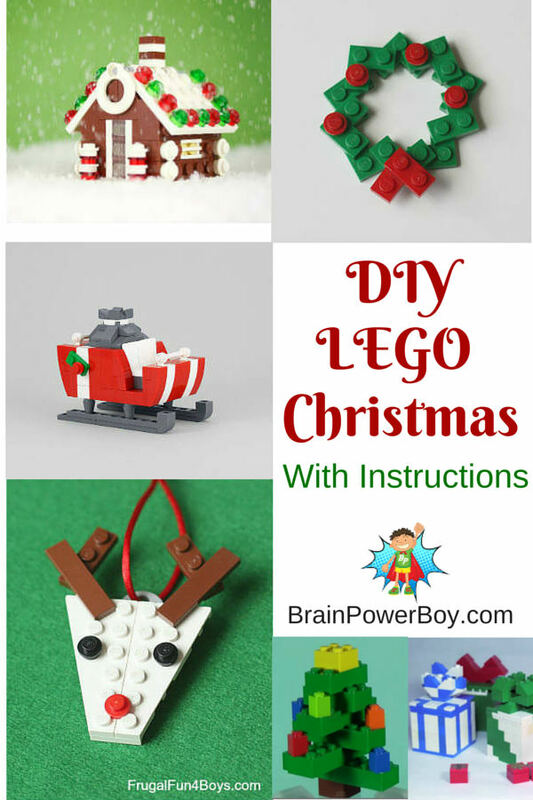 You can make a LEGO reindeer, build a LEGO Christmas tree, create some LEGO ornaments, plus make some small gift boxes that actually have a working lift-able lid. I hope you and your kids will have a lot of fun building! After you are done reading be sure to see all of our other LEGO designs. Take a look at these DIY LEGO Christmas projects and see if you have the pieces to build the ones you like. Keep in mind you can substitute pieces and be flexible with colors, or you can purchase individual pieces through the pick-a-brick section on the LEGO site. For pieces you may need visit the official LEGO shop! There are some fun minifig heads, bodies and accessories in there too–which we love to get. We enjoy collecting unusual and useful pieces for our stash. Chris McVeigh has a wonderful LEGO Santa’s Sleigh to build. It is so fun to make. Chris generously shares directions for his builds on his website. Scroll to the bottom to see the sleigh. I was super excited to see his LEGO Gingerbread House and hope you like it too. Pretty neat, eh? I am inspired to make one myself! Love reindeer? Then why not make an easy to build reindeer made with plates from Frugal Fun for Boys. They also have a wreath that is pretty simple but impressive. Either one would also make a nice gift tag for a Christmas gift. Try this simple LEGO Christmas tree. I like this because it can be made with bricks you likely already own. Here are the LEGO Gift boxes that have a hinged lid. Pretty neat, right?! Build them together OR you could stick a printable gift certificate for a LEGO experience into one of these little LEGO packages for a really neat Christmas surprise. See our LEGO Gift Guide, some wonderful LEGO experiences, and a free printable gift certificate too! Enjoy making these fun Christmas LEGO projects together! If you don’t want to mess with having to find all the pieces here are some LEGO Christmas Sets! Check out our LEGO Gift Guide for Christmas ideas! There are some awesome picks here. 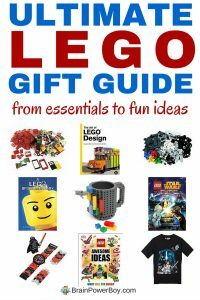 From books to bricks this gift guide should be at the top of your list for finding the perfect LEGO gift for your fan. You will find the must have essentials that make building and creating with LEGO much better as well as some very cool picks that you simply much see. They are going to love them! These are fantastic! I can’t wait to show the tutorials to my boys. Thanks Cindy–so glad to hear you are sharing these with your boys. That is why I do this! You know Sam is going to love this! I always love your Lego posts. Thanks! Gift boxes made out of LEGO?? Love that! I can’t wait until my kiddos are old enough to graduate to LEGO – right now we’re on Mega Bloks and they come apart far too easy! Those gift boxes are neat, aren’t they Clare? I agree that Mega Block do fall apart very easily. You could try Duplo pretty soon. We liked those better. I’m totally going to keep these in mind for my nieces! This is perfect! My kids made some LEGO ornaments last week and are wanting more ideas. Super! So glad to hear your kids will enjoy these Keri. Hi I am visiting from How To Get Organized At Home, I just wanted to stop by and say thank you for visiting and sharing your post. This is awesome, I love these lego themed ideas thank you for sharing. Why do you make it sound as if lego is only for boys? My daughter loves lego, as have my sister and myself when we were kids. I think this is an unnecessary restriction for a fantastic toy. I’m having trouble with the link to build santa’s sleigh and the gingerbread house. It just takes me to Chris’ website, but I can’t find the sleigh even after clicking around. Thanks for letting me know. I do believe that has moved! Sorry about that. I sent you an email and also fixed the links here.